Sharad Kumar Yadav was struck by polio on the left leg when he was just two years old but it hasn't deterred him from jumping from one glory to another. The 26-year-old, an alumnus of St Paul's School in Darjeeling, will compete in high jump at the Paralympics in Rio de Janeiro, Brazil, which starts tomorrow. As a student of St Paul's, Sharad had shattered inter-school high jump records by competing with able-bodied athletes. At the Asian Para Games in Incheon, 2014, he won gold and broke a 12-year-old high jump record. For Sharad who learnt his skills at St Paul's, the competition will also be an opportunity to return to his alma mater. "We wanted to invite him as the chief guest to our annual school sports this year. We could not because he had told one of our teachers, Arnold Mukhia, after winning the Asian Games gold medal and setting a new record that he would visit St Paul's only after bagging a gold at Paralympics," said Anil Deep Rai, a physical training instructor at the school. Mukhia, who is in regular touch with Sharad, said he was willing to visit other school but not St Paul's where he had nurtured his dreams. "After St Paul's, Sharad went to Modern School in Delhi and then did his college at Kirori Mal before doing his post-graduation at JNU. He is willing to go to other institutions that he studied but does not want to come to St Paul's without a Paralympic gold medal," he said. Paralympic Games are for athletes with disabilities and are equivalent to the Olympics. Sharad, who comes from Patna, had joined Class IV at St Paul's in 2001 and studied till Class X. "He was the first differently abled student that I came across at the school during my 25 years of career. But he was a determined student. You could never keep him out of the sports," said Angelo Alva, a teacher at St Paul's. Sharad played football, cricket, basketball and even badminton. "He was a goalkeeper in the football team and a wicketkeeper in the cricket team of the school. He represented the school in cricket and athletics," said Alva. Surendra Yadav, father of Sharad, said: "The entire family is extremely happy that he is participating in Rio Paralympics. We are hopeful that he will bag a gold. This year, he trained in the US for six months from January and we are hopeful that the stint will help him perform better." While most students would usually jump the bar using Western roll (with belly down) and scissor (upright jump) at inter-school events, he perfected the fosbury flop technique (jump with the belly up), which is followed by all top high jumpers. "We would never encourage fosbury flop technique as it was dangerous and there was no provision for providing mats. They had to land on mud and that would be dangerous," said Alva. The school authorities had to fight at inter-school events for a mat to be placed for Sharad. The differently abled athlete has an inter-school high jump record which has not yet been broken by even able-bodied boys. 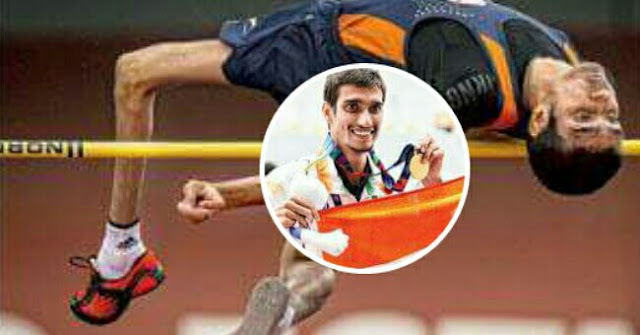 "He broke the school high jump record that had been set by his elder brother Shallaz, just a couple of year earlier," said Agnelo Dennis, English teacher, who had suggested that he move to Delhi for better training so that he could compete in the Paralympics one day . Interestingly, Sharad is the third Olympian from St Paul's after Paul Raschid, who participated in boxing at the 1948 London Olympics, and Peter Hildreth, who competed in the 110 meter hurdles in the 1952, 1956 and 1960 Olympics. Rev Joy Halder, rector, St Paul's, said: "It is indeed a matter of great pride that we will now have three Olympians from our school."